Is it going to be a movie? Yes! But it’s in very early stages. All we know is that Sarah Polley will be directing. Miles “Pudge” Halter leads a very boring with life with no friends until he attends Culver Creek Boarding School searching for a “Great Perhaps.” There he meets Alaska Young, Chip “The Colonel” Martin and Takumi Hikohito who changes his life for the better (and the worse). Pudge falls for Alaska upon meting her; she’s smart, funny, beautiful, screwed-up and draws him in completely. He goes from reading biographies and memorizing people’s last words to smoking, drinking, pulling pranks and having the time of his life. But then something happens that completely changes his world again. Looking For Alaska reminded me a lot of The Perks of Being A Wallflower. There’s the socially awkward yet lovable boy (Pudge/Charlie) that gets pulled into a new circle of friends consisting of a beautiful, charming and self-destructive girl (Alaska/Sam) and the girl’s best friend who is more stable but just as fun (The Colonel/Patrick). But I loved Perks so I didn’t entirely mind all the similarities. 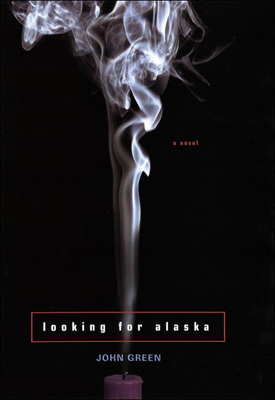 Even though I probably prefer Perks, I still really enjoyed Looking for Alaska. I am becoming a huge fan of John Green (I know I’m a little late to the party) as I mentioned in my Fault in Our Stars review. He has an infinite amount of great quotes and his style is perfection. Basically all hail John Green forever and always. One thing I really like about Alaska is that it’s split into two sections: Before and After. Every chapter starts with a countdown (X Days Until…) to After. It’s a simple but effective way to keep me even further enthralled in the book. The story and characters were enough to keep me reading but the countdown made me feel like I had to know what was going to happen. Yes! Especially if you are a girl in the preteen-young adult age range. Even if you’re not, it’s a great book. You can get a copy at Thriftbooks or Amazon. This entry was posted in Book and Movies, Book Reviews and tagged book blog, book review, book reviews, John Green, Looking For Alaska, Looking For Alaska book, Looking for Alaska book review, Looking For Alaska movie, ya, ya books, young adult, young adult books. Bookmark the permalink.